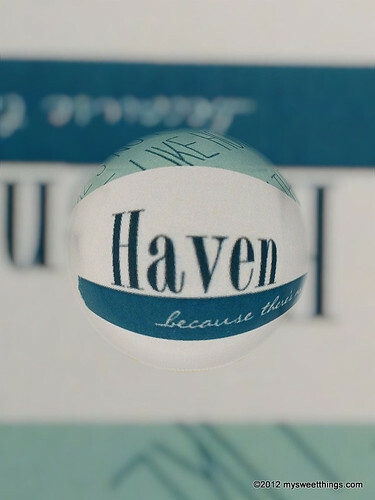 Attending the Haven conference was the BEST thing I have done for myself in a long time. It is just what I needed to boost my spirit and rekindle my creative fire. I am not quite sure what the final attendee numbers were and I thought I read that it was up around 260. 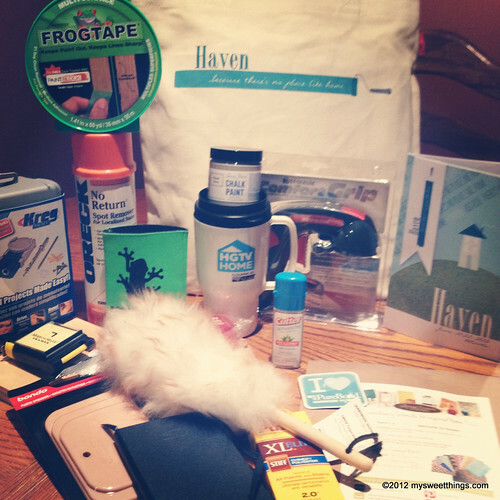 I headed to Haven hoping to meet fellow bloggers who share the same interests that I have. That mission was accomplished and my heart is full and my mind is overflowing with creativity. I arrived at the Crowne Plaza on Wednesday evening where the conference was held to attend the welcome cocktail party. I live in Atlanta and I tried to book a room at the hotel but they were full. 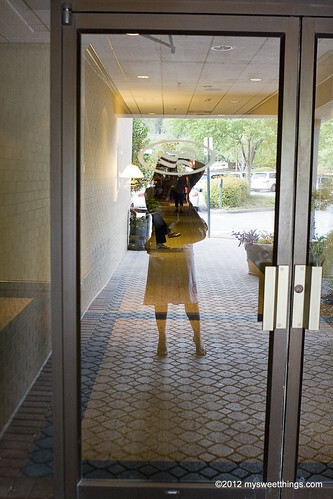 I heard a few fellow bloggers say they also could not get a room and some felt they might miss the whole conference experience by not staying at the hotel. I can say that even though I did not stay at the hotel, I felt every bit filled by the conference and had a wonderful time! 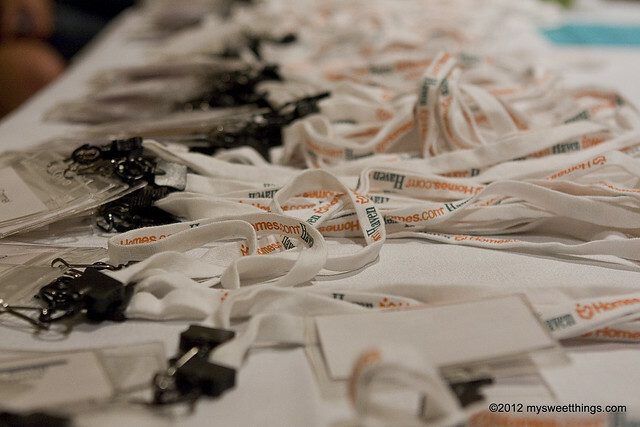 When I found the Haven check in, I saw so many name tags. I received my name tag and a swag bag filled to the top with goodies! 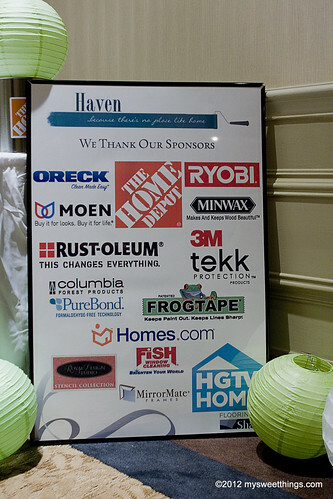 Haven had so many generous sponsors! When I say generous, take a look at all this swag! I met Amanda from Serenity Now at the cocktail party! 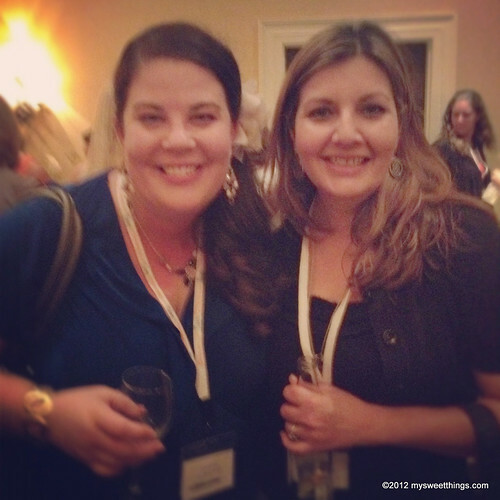 I have participated in her Weekend Party Reading Link Up and it was so nice to meet her in person! The cocktail party was buzzing! 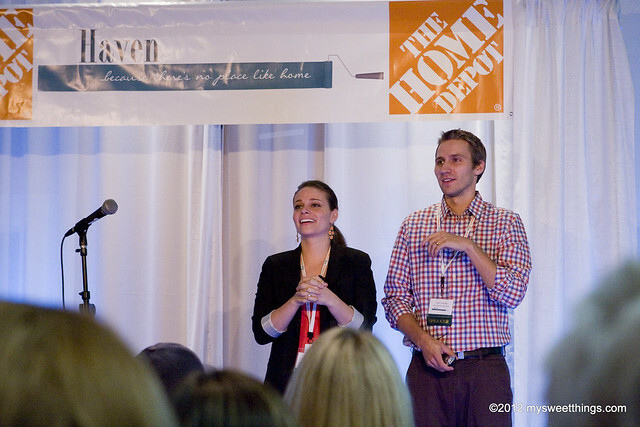 The first full conference day was on Thursday and the keynote speakers were John and Sherry fromYoung House Love. I follow along with their home DIY adventures and it was so great to see them in person! 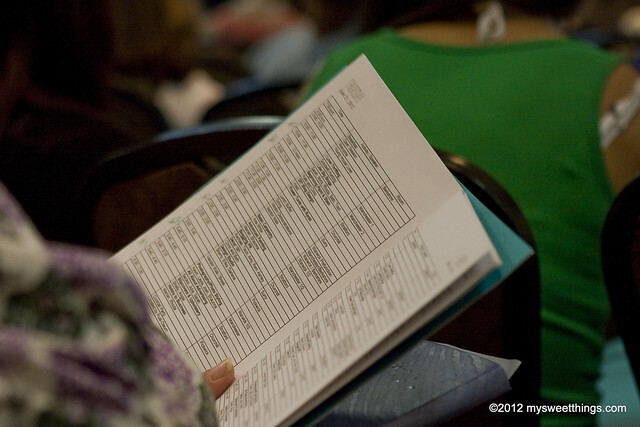 There were so many sessions to choose from! 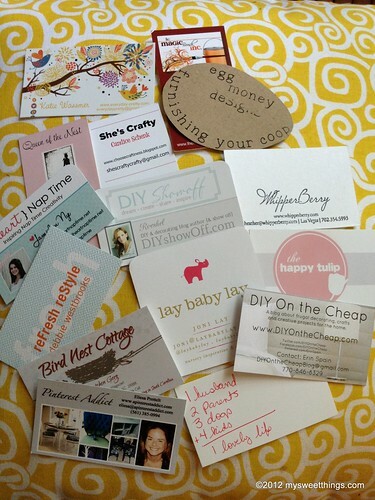 I choose I like big blogs, Power Tools with Ryobi ( I won a Home Depot Gift Card in that one! 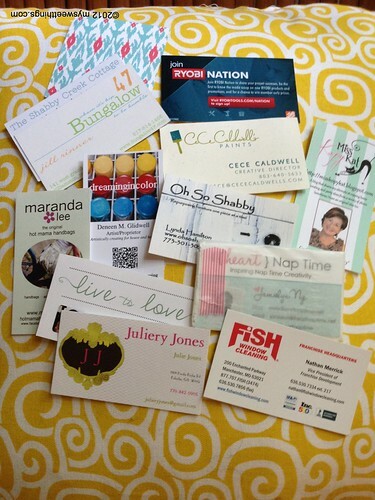 ), Advanced Painting, Basic Carpentry with Ana White, Basic Photography/Photo Styling, and All About Advertising. Whew! They were all so informative. 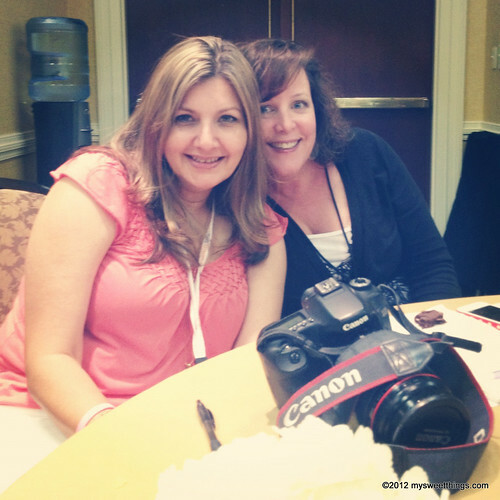 Each session was full of great tips that will help me with my blog redesign as well as home improvement! 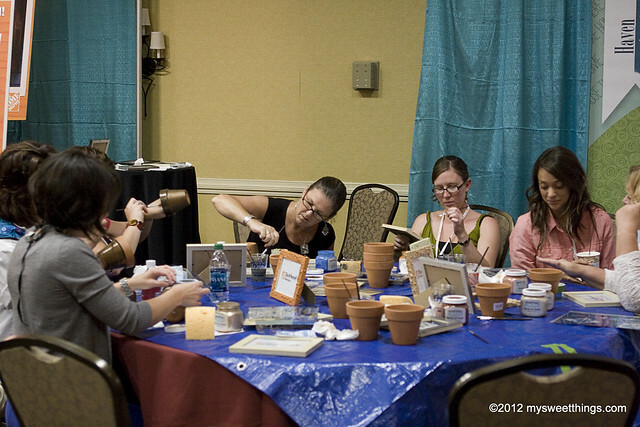 Between the morning and afternoon session break, there was an area set up for crafting! I loved that. There was also a coffee bar that many lined up for a caffeine fix! 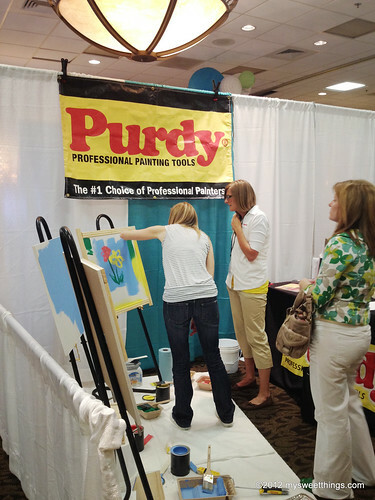 The vendor area was set up and many hands on activities were available! 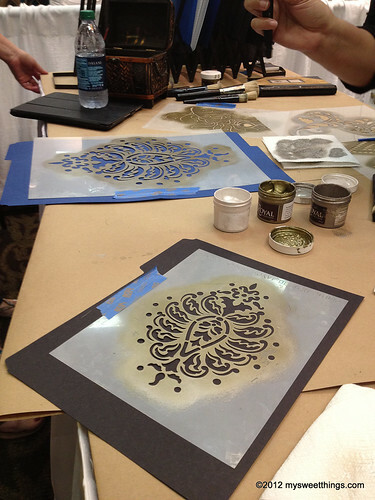 Here is a stencil project I worked on courtesy of Royal Design Studio! 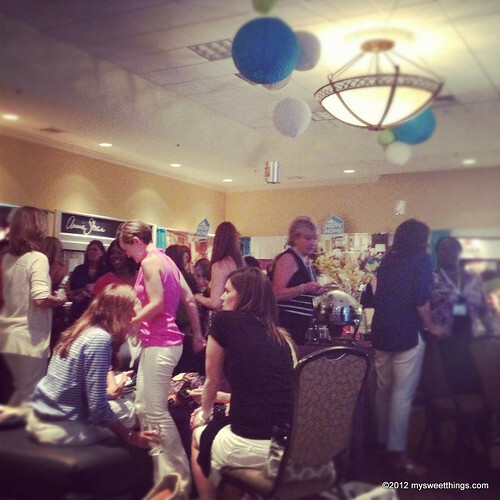 Here is a quick shot of the cocktail party held on Thursday night! 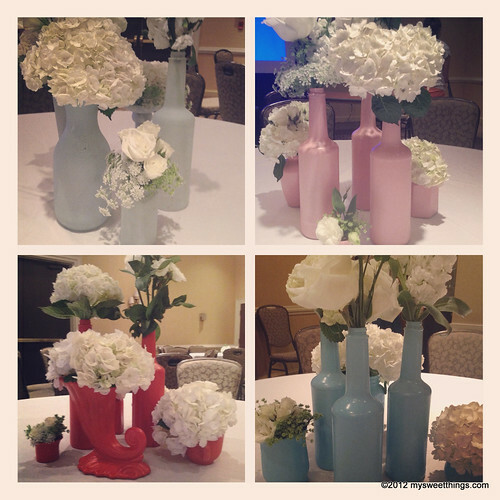 Gorgeous centerpieces courtesy of Rust-Oleum. A photo op with Sherry aka Young House Love and Layla aka The Lettered Cottage. There were a lot of new friendships made! I especially like Kim’s card. She hand wrote hers! She was funny and kind and I enjoyed our breakfast and lunch conversations. 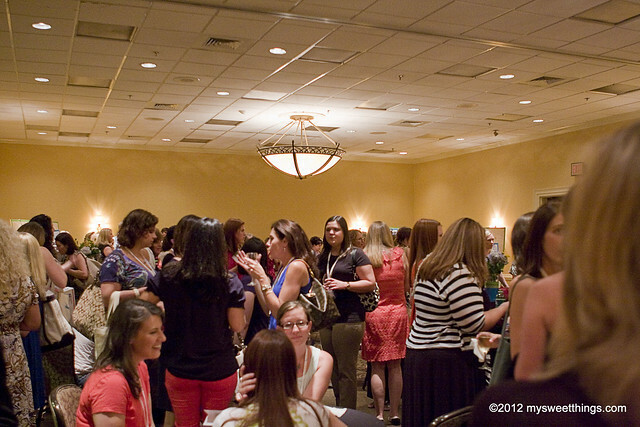 All the bloggers I met were so kind and approachable. 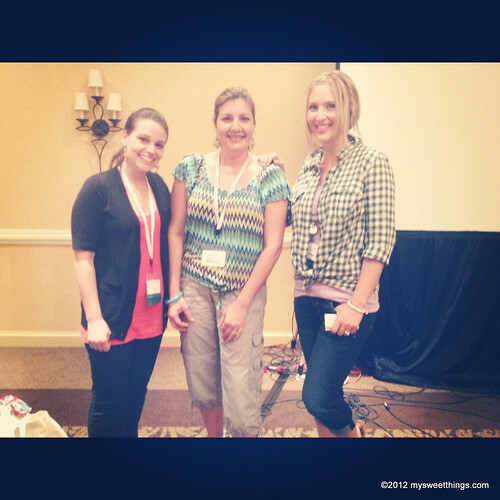 They were so quick to share tips on what works for them in their blogging journey. I am grateful that they shared so much knowledge with me. This picture is one of my favorites. That’s Elizabeth who does not have a blog but refinishes furniture and has a shop she sells her work in. Sometimes in life you cross paths with a soul who embraces you and a connection is made. I am so blessed to have crossed paths with her and I look forward to building our friendship. I have so many more photos to share. You can find them at the Haven 2012 flicker group by clicking here. I am listed as dsolzer. I went into Haven hoping to meet new friends with like minds and I came back from the conference with more than I expected. I am Haven blessed! Thank you to Rhoda, Kristen, Beth, Chris, Kate, Kristi (thanks for sharing your military experience with me at breakfast! ), Marian, Sarah, and Traci for all your hard work in putting together such a wonderful experience. I appreciate your time, smiles, laughter, and keeping it real! I so look forward to Haven next year!